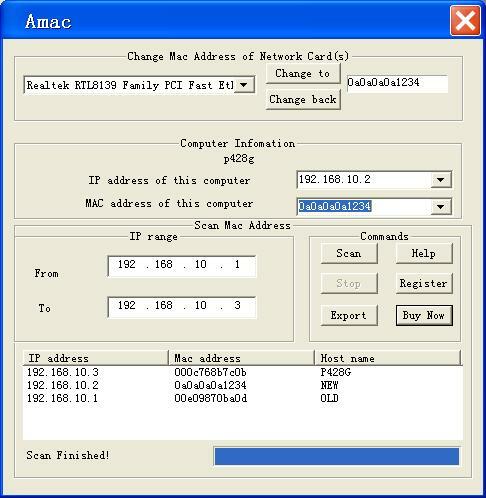 A-MAC Address Change can change Mac Address in seconds! Scan Remote Mac Address. Exports the scanning results from a Mac Address Lookup list. Spoofing the Mac Address of your network card to any new Mac Address. Bind MAC/IP. Wake on Lan. Win Ipconfig. Port Scan. Scan any range of IP for the proper Mac Address. Support changing Mac Address of any network cards under Windows. Support exporting scanning mac address results to txt or csv file. Network card with mac address or modem. It's shockingly easy to use ??? just a simple input and click, that's it! It runs on all Windows? operating systems (i.e., win7/vista/95/98/NT/2000/Me/XP/2003). Qweas is providing links to A-MAC Address Change 6.0 as a courtesy, and makes no representations regarding A-MAC Address Change or any other applications or any information related thereto. Any questions, complaints or claims regarding this application A-MAC Address Change 6.0 must be directed to the appropriate software vendor. You may click the publisher link of A-MAC Address Change on the top of this page to get more details about the vendor.